The Coverworx Steelworx steel-frame shelters and structures are custom crafted from durable, high gauge steel. The beauty and creativity behind every one of the Steelworx shelters comes from years of experience held by ASTM-certified welders, structural fabrication specialists, and skilled design engineers. A few of the virtually unlimited options for Steelworx shelters include handrails, overhead lattice, round or custom designed support columns, pine or cedar tongue and groove overhead decking, and cupolas. Corrugated and standing seam metal roofing is available on all structures. 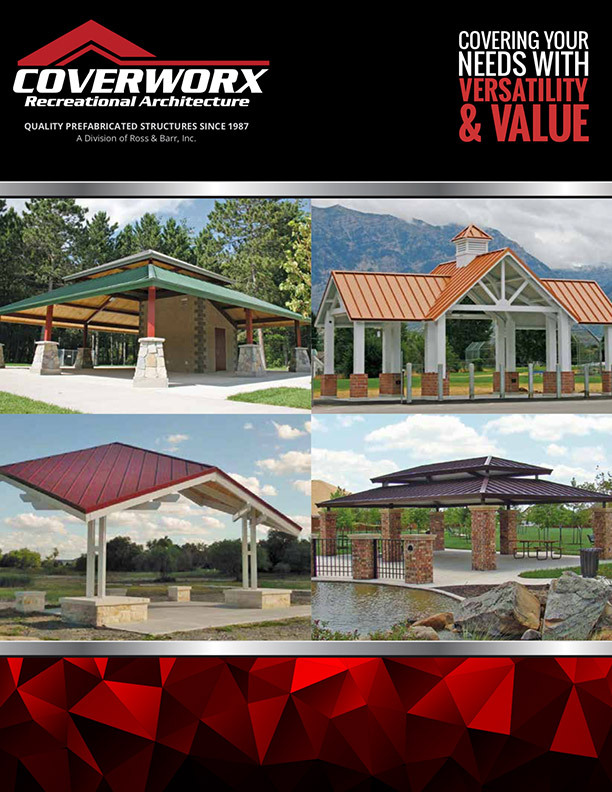 Standard shapes available include Squares, Hexagonal, Octagonal, and Rectangular Open Gable or Hipped ends. Custom shapes, combinations of shapes, rounded or curved tops are always welcome and are an exciting way to add class and style to any landscape setting imaginable. Consider a Coverworx “Vented Top” option to your Steelworx structure. It’s a functional way to address style or venting needs. The versatility of Coverworx structure design is only limited to your imagination!